DeMarcus Cousins is the center for the Sacramento Kings, playing in his third NBA season. To this point, the Kentucky alum has put together a solid start to his career, making the 2011 NBA All-Rookie first team, as well as participating in the 2012 BBVA Rising Stars Challenge. Entering the 2012-2013 season, Cousins owns a career average of 15.9 points and 9.7 rebounds per game. Above is an iFolloSports.com original photo of Cousins entering the Target Center in Minneapolis, a few hours prior to the Kings and Minnesota Timberwolves game last week. 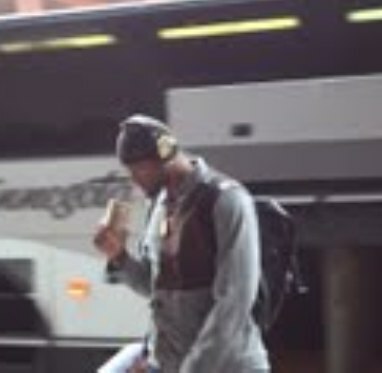 In the picture, Cousins appears to be pretty focused, while wearing headphones and drinking what looks to be a cup of coffee. In this contest, Cousins totaled 11 points and 4 rebounds, during Sacramento's 92-80 loss to Minnesota. Here is an additional iFolloSports.com original story and video, from last season, featuring Cousins joking around with teammates, while warming up for a game also in Minnesota.